ADAM33, the first asthma candidate gene identified by positional cloning, may be associated with childhood asthma, lung function decline and bronchial hyperresponsiveness. However, replication results have been inconclusive in smaller previous study populations probably due to inconsistencies in asthma phenotypes or yet unknown environmental influences. Thus, we tried to further elucidate the role of ADAM33 polymorphisms (SNPs) in a genetic analysis of German case control and longitudinal populations. Using MALDI-TOF, ten ADAM33 SNPs were genotyped in 1,872 children from the International Study of Asthma and Allergy in Childhood (ISAAC II) in a case control setting and further 824 children from the longitudinal cohort Multicentre Study of Allergy (MAS). In both populations the effects of single SNPs and haplotypes were studied and a gene environment analysis with passive smoke exposure was performed using SAS/Genetics. No single SNP showed a significant association with doctor's diagnosis of asthma. A trend for somewhat more profound effects of ADAM33 SNPs was observed in individuals with asthma and BHR. Haplotype analyses suggested a minor effect of the ADAM33 haplotype H4 on asthma (p = 0.033) but not on BHR. Associations with non atopic asthma and baseline lung function were identified but no interaction with passive smoke exposure could be detected. The originally reported association between ADAM33 polymorphisms and asthma and BHR could not be confirmed. However, our data may suggest a complex role of ADAM33 polymorphisms in asthma ethiology, especially in non atopic asthma. ADAM33, a disintegrin and metalloproteinase 33 has been the first gene published, which had been identified by positional cloning as a putative candidate gene for the development of asthma and bronchial hyperresponsiveness . It has been speculated that the ADAM33 gene, expressed in airway smooth muscle cells and fibroblasts of the lung, codes for a protein important for cell fusion, cell adhesion, cell signalling and proteolysis. Furthermore, ADAM33 was suggested to play a role in airway remodeling . The ADAM33 gene is located on chromosome 20p13 and 37 SNPs have initially been identified . Ever since the first report of association between ADAM33 polymorphisms and asthma in two Caucasian populations from the UK and the USA, a number of replication studies have been published with very diverse results. Various associations between different asthma phenotypes as well as with BHR and several different SNPs in the gene have been reported [3–7]. One possible explanation for this diversity in replication results could be the heterogeneity between study populations or between the definitions of asthma in different study populations. It can be hypothesized that ADAM33, involved in remodeling, may be especially important in some specific forms of asthma. Thus, it may be more relevant in adult or non-atopic than in atopic asthma. Furthermore, it may affect lung function more than atopy status. Finally, environmental factors such as passive smoke exposure could potentially interact with ADAM33 in exerting its remodeling function in the lung as ADAM33 also seems to be involved in COPD mediated processes. We tested the hypothesis that the ADAM33 gene is associated with atopic or non atopic asthma, lung function and BHR in a large nested case control study of German children (N = 1,872; comparing 624 asthmatics and/or BHR positives and 1,248 non-asthmatic, BHR negative, non-atopic controls) and a German multicentre family based birth cohort study (MAS) (888 children with DNA available, 96 asthmatics and 792 non-asthmatics). The effect of ten SNPs spanning the ADAM33 gene as indicated in figure 1, previously showing associations with asthma phenotypes in some populations, and haplotypes of these SNPs were analysed. Position of the genotyped polymorphisms (SNPs) in the ADAM33 gene in respect to the 22 exons (blue) and untranslated regions (red) of the gene. SNPs nomenclature according to the initial report by Van Eerdewegh et al. and alternatively according to the rs system in brackets. Between 1995 and 1996, cross sectional studies were conducted in Munich (ISAAC II), Dresden (ISAAC II) and Leipzig to assess the prevalence of asthma and allergies in schoolchildren age 9 to 11 years [9, 10]. As the populations and phenotyping methods have been described in detail before , only an overview of the methods pertaining to this analysis is given here. Parental questionnaires for self-completion were sent through the schools to the families including the ISAAC core questions while slightly different questionnaires were used for the Leipzig population . All children in the three cities whose parents reported that a doctor diagnosed "asthma" at least once or "asthmatic, spastic or obstructive bronchitis" more than once were defined as having asthma. In Dresden and Munich, children underwent skin prick testing for six common aeroallergens (Dermatophagoides pteronyssinus, D. farinae, Alternaria tenuis, cat dander, and mixed grass and tree pollen) while in Leipzig D. pteronyssinus, grass, birch and hazel pollen, cat and dog dander was examined . A positive skin reaction was defined as a wheal size ≥ 3 mm after subtraction of the negative control . In the Munich and Dresden population, standard baseline lung function was measured and bronchial reactivity was assessed in a random 50% sub-sample of the study population by inhalation of nebulized, hyperosmolar saline (4.5%). Children with a drop in FEV1 of 15% or more from baseline were classified as positive for bronchial hyperresponsiveness . In the Leipzig population, measurements of airway challenges utilizing cold-air challenge were performed according to a previously published protocol . In this case BHR was defined as a fall in FEV1 of 9% corresponding to a value as large or larger than the 95th percentile of the reference population . For this analysis, all children of German origin who had both DNA and IgE data available and had a doctor's diagnosis of asthma and/or showed BHR (N = 624, Munich n = 230, Dresden n = 263, Leipzig n = 131) were selected from the total study population. These children were matched at a 1:2 ratio with a random selection of healthy, non asthmatic, non atopic children without a diagnosis of BHR (Munich n = 460, Dresden n = 526, Leipzig n = 262) in the analysis. The German Multicentre Allergy Study (MAS) cohort has been described in detail elsewhere [12, 13]. Initially, 1,314 children born in five German cities in the year 1990 were followed up from birth to the age of 13 years. For 888 children DNA was available and of these, only children of German origin were included in this study (n = 824). Yearly follow-up visits included standardized interviews, questionnaires, and physical examinations. In the MAS study, asthma, hay fever and atopic dermatitis at age 10 were defined using the ISAAC-core questions for children as described for the ISAAC study population. Serum samples were obtained from the children at birth, and at 1, 2, 3, 5, 6, 7 and 10 years of age. Total IgE, specific IgE antibodies to food allergens and inhalant allergens (Dermatophagoides pteronyssinus, cat dander, mixed grass, birch pollen, as well as dog dander from age 3 years on) were determined by CAP-RAST FEIA (Pharmacia & Upjohn, Freiburg, Germany). In the MAS study, atopy was defined as a specific IgE level (CAP I) of ≥ 0.35 kU/l at age 7 or 10 years, respectively. While pulmonary function tests were performed at age 7, 10 and 13, bronchial hyperresponsiveness was only assessed at age 7 in 610 individuals . Bronchial challenges in the MAS study were conducted after baseline spirometry using increasing concentrations of histamine (usually from 0.5 mg/ml to 8.0 mg/ml) according to standard procedures. The 90th percentile of the distribution of PC20FEV1 in a healthy subsample corresponded to 0.85 mg/ml. Bronchial hyperresponsiveness was defined as a PC20FEV1 greater than this value. Current environmental smoke exposure was defined as any current environmental tobacco smoke exposure at the age of the survey in ISAAC (9–11) and at the age 10-survey in MAS according to the information derived from parental questionnaires. In utero exposure to maternal smoking was assessed by a positive answer to the question "Did the mother of the child smoke during pregnancy?". Informed written consent was obtained from all parents of children included in the ISAAC and MAS studies. All study methods were approved by the local ethics committees. For genotyping, the MassARRAY system (Sequenom, San Diego, USA) was used as previously described in detail . All PCR reactions were performed using standard thermocyclers (MJ Research, Waltham, USA). First, a PCR was carried out. To remove excessive dNTPs, shrimp alkaline phosphatase was added to the PCR products. The base-specific extension reaction was performed in 10 μl reactions by Thermosequenase (Amersham, Piscataway, USA). For the base extension reaction the denaturation was performed at 94°C for 2 min, followed by 94°C for 5 sec, 52°C for 5 sec, and 72°C for 10 sec for 55 cycles. The final base extension products were treated with SpectroCLEAN resin to remove salts out of the reaction buffer, and 16 μl of water was added into each base extension reaction. After a quick centrifugation (2,000 rpm, 3 min) the reaction solution was dispensed onto a 384 format SpectroCHIP pre-spotted with a matrix of 3-hydroxypicolinic acid (3-HPA) by using a SpectroPoint nanodispenser. A modified Bruker Biflex matrix assisted laser desorption ionization-time-of-flight mass spectrometer was used for data acquisitions from the SpectroCHIP. Genotyping calls were made in real time with MASSARRAY RT software (Sequenom, San Diego, USA). Deviations from Hardy-Weinberg equilibrium were investigated for all polymorphisms using the χ2 statistic, with expected frequencies derived from allele frequencies. Associations between SNPs and qualitative outcomes were determined using Cochran-Armitage-Trend-tests and χ2-tests in dominant models of the rare allele. Differences in lung function parameters were tested by univariate variance analysis and t-tests in dominant or recessive models. Linkage Disequilibrium (LD) and the LD block structure were assessed using Haploview  and haplotype analysis was performed for all tagging SNPs after haplotype frequencies had been estimated by the EM (expectation-maximisation) algorithm . Haplotype associations with asthma and BHR were calculated with the haplotype procedure in SAS/Genetics. In addition, haplotype trend regression models were estimated, where the estimated probabilities of the haplotypes were modelled in a logistic regression as independent variables . For asthma as a binary outcome, logistic regression models for gene-environment interactions were used to estimate the combined effect of each SNP with exposure to environmental tobacco smoke (in utero and at time of survey). A Botto Khoury approach summarizing the data in a 2 × 4 table allowed for the evaluation of the independent and combined roles of genotype and exposure on disease risk . All statistical analyses were carried out using the SAS statistical software package (Version 9.1) and the SAS/Genetics module. Ten polymorphisms previously identified and showing associations in at least one replication study were selected for genotyping (table 1). These SNPs, located in the 3' half of the gene, spanned the known ADAM33 linkage structure as indicated in figure 1. Call rates for SNPs in ADAM33 ranged from 90.9% to 93.7% in the family based study population, from 92.1% to 94.3% in the case control population and from 91.9% to 94.0% in the pooled sample as indicated in table 1. All SNPs were in Hardy Weinberg equilibrium in both populations. In the population based cross sectional study populations from East and West Germany, all SNPs showed allele frequencies similar to those previously published in other Caucasian populations (table 1). Genotype frequencies and linkage disequilibrium were almost identical in both the case control population and the MAS cohort (data not shown). Description of the investigated ADAM33 SNPs and assay conditions in the case control and cohort study population. Associations between ADAM33 polymorphisms and the phenotypes asthma and BHR were investigated in both populations. As children in the case control sample were 9–11 years old at the time of disease status assessment and children in the longitudinal MAS study population were assessed using the same ISAAC core questions at age 10, all analyses of association with asthma in the MAS population were also performed at this and no other age. As BHR values were only available at age 7 but not at age 10 in the MAS population, BHR was analyzed separately in both populations. No significant association could be detected between any tested SNP and doctor's diagnosed asthma, neither in the case control population nor in the cohort study, nor in the pooled dataset (table 2). However, the risk to develop non atopic asthma (as defined as a doctor's diagnosis of asthma in the absence of a positive skin prick test) was increased in carriers of the polymorphic A allele in S1 (OR 1.53, 95%CI 1.01–2.31, p = 0.042) and in carriers of the polymorphic G allele in V4 (OR 1.44, 95%CI 1.03–2.01, p = 0.031). Furthermore, the risk for non atopic asthma was decreased in carriers of the polymorphic T allele for M+1 (OR = 0.60, 95%C.I. 0.40 – 0.91, p = 0.016). Odds ratios (OR) and 95% confidence intervals (95% CI) for the association between single ADAM33 polymorphisms and asthma and BHR in the case-control population (age 9–11) and in the cohort study population assessed at age ten for asthma and age seven for BHR. No significant association between ADAM33 polymorphisms and BHR, assessed by histamine challenge in the MAS population at age 7 or with hypertonine saline inhalation or cold air challenge in the case control population at age 9–11, was observed as shown in table 2. As the initial study by van Eerdewegh et al. suggested the major effect of ADAM33 polymorphisms in individuals with asthma and concomitant BHR, we investigated this specific phenotype in the case control population. Again, no SNP reached statistical significance in the association analysis (table 2). As BHR values were only available at age 7 but not at age 10 in the MAS cohort study and different procedures were used to define BHR in both study populations, no combined analysis with both outcome variables was performed. Next, the effects of ADAM33 SNPs on baseline lung function measurements (FVC, FEV1, MEF25, MEF50 and MEF75) were investigated in cases (asthma and/or BHR positive) and controls separately (table 3). In cases, FVC was increased in carriers of S2, T1 and T2 polymorphisms while FEV1 was increased in carriers of S2 and M+1 polymorphisms. In contrast to polymorphism S1, the presence of the polymorphic C allele in S2 increased the values for MEF75. In controls, negative effects on MEF50 were observed with ST+5 and MEF75 was increased in carriers of the M+1 or S2 SNP. 1)N refers to the first lung function parameter. Minimal deviations of N in the other lung function parameters are possible. In a further step, haplotypes were estimated in both populations for all samples genotyped successfully for at least one ADAM33 SNP (1,802 in the case control population and 782 in the MAS cohort) using the EM algorithm. The estimated frequencies of all common ADAM33 haplotypes built from the eight SNPs F+1, S1, S2, ST+4, ST+5, ST+7, T1 and V4 and all ten SNPs are presented in table 4. As SNPs M+1, T1 and T2 were in extremely tight linkage disequilibrium, polymorphisms M+1 and T2 contributed no additional information to the haplotype and thus were excluded from the further haplotype building procedure. One common haplotype, H4 (G-G-G-C-C-G-T-G), showed a weak but not significant association with asthma in the case control population but not in the cohort as indicated in table 5a. This association became significant in the pooled analysis. No association was found with BHR (data not shown). When a haplotype trend regression was performed for the haplotype H4, an OR of 1.57 (95%CI 0.99–2.51, p = 0.057) in the pooled population was observed. As it was hypothesised that ADAM33 could influence the effects of passive smoke exposure on asthma, BHR or lung function, gene environment interactions were assessed using a Botto Khoury approach. However, no such interactions could be detected (data not shown). We have genotyped 2,696 subjects including more than 700 children with asthma and/or BHR for 10 SNPs in the ADAM33 gene. For doctor's diagnosed asthma, no SNP showed a significant association in any of the analyzed populations. A trend for somewhat more profound but not significant effects of ADAM33 SNPs was observed in individuals with asthma and BHR, for which trait the most significant association results were reported in the original study on ADAM33. However, in the case control population, these associations did just not reach statistical significance. Haplotype analyses suggested a minor effect of the ADAM33 haplotype H4 on asthma but not BHR. A number of individual SNPs showed an association with non atopic asthma in the case control population. A diverse picture evolved when the effects of ADAM33 polymorphisms on baseline lung function were measured. However, these associations did not remain significant after correction for multiple testing. No interaction with passive smoke exposure could be detected. ADAM33 was the first published candidate gene for asthma identified by positional cloning. In the initial report 37 SNPs in the ADAM33 gene have been identified and 15 polymorphisms have been genotyped in a UK and a US study population . Even within these two populations, different SNPs were associated with asthma and BHR. Associations were significantly stronger in those cases additionally showing BHR, suggesting that ADAM33 acts via lung specific mechanisms. A putatively functional role for ADAM33 in the pathogenesis of asthma has been hypothesised as ADAM33 is expressed in smooth muscle cells of the bronchial and vascular system in the lung [1, 20]. It has been speculated that ADAM33 may act as a protease activating cytokine or induce airway smooth muscle proliferation. ADAM33 and its so far identified polymorphisms may have less to do with atopic inflammation and more with non atopic lung specific forms of asthma. To a somewhat lesser degree, this initial BHR effect was confirmed in our study population. In terms of replication on a population level, the role of ADAM33 SNPs in asthma remains controversial. It seems that even the studies reporting a positive association between ADAM33 SNPs and atopic phenotypes are inhomogeneous in their findings (table 6). These inconsistencies in replication may have different reasons. They could be due to population heterogeneity, as some studies may suggest. Howard and co-workers genotyped 8 SNPs in 4 different ethnical populations (Dutch, white Americans, Hispanics and African Americans) and found a wide variety of associations between the different ethnical groups and various ADAM33 SNPs . No single SNP was associated with asthma in all 4 groups and when corrected for multiple testing, only one association remained significant. In studies of asthmatics with a Hispanic background, no association with ADAM33 SNPs was observed with asthma . Thus, differences in haplotype structure or even in the occurrence of SNPs may exist between ethnicities, which have not yet been investigated sufficiently for ADAM33 but which are known to exist for a number of other genes. 4in the study of Raby et al. 8 additional SNPs were investigated: G1, I1, KL+3, N1, S+1, T+2, V-2, V3. None of the additional SNPs showed an association with asthma. A further explanation for the differences in replication results might be that the definition of asthma may have varied between studies. As ADAM33 may specifically affect remodeling of the lungs, the impact of genetic variations in ADAM33 could be variable in different forms of asthma. In other words, ADAM33 genetics may have more impact on those forms of asthma which are less driven by atopy and more associated with lung specific mechanisms. Our data indeed suggests that the known ADAM33 SNPs have only a minor impact on the most common form of childhood asthma, which is highly correlated with atopy in most study populations. In contrast, a number of ADAM33 SNPs were associated with non atopic asthma as well as baseline lung function measurements in our study. However, the pattern of association remains complex as different SNPs are associated with non atopic asthma and determinants of lung function. Moreover, ADAM33 SNPs also seem to play a different role in adult asthma than in childhood asthma as indicated by previously published studies. Werner et al. 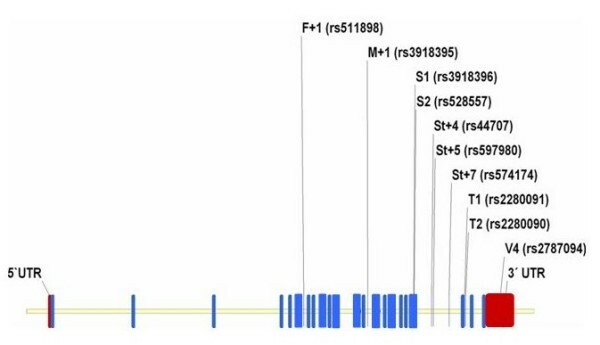 genotyped 15 ADAM33 SNPs in a family based and in an adult case control population and observed variable associations between SNPs and asthma within the two populations and also in respect to the initially reported associations . Very large studies investigating childhood asthma by Lind  and Raby  could not find any association between single ADAM33 SNPs or haplotypes and childhood asthma. However, no analyses of ADAM33 effects on non atopic asthma have been reported in these studies of childhood asthma. While Raby et al. stated that it seems very unlikely that these negative studies were underpowered to detect an association, a recent meta analysis suggested, that the odds ratio for the ADAM33 locus may be in the order of 1.4 or lower for SNPs known to date . Even with large data sets such as used in this study, the ability to detect risks of this magnitude may be limited. Furthermore, it may be possible that the known SNPs in ADAM33 are only a proxy for additional, yet unidentified SNPs in the ADAM33 gene, which could be the true cause for the observed but mixed signals from this locus. Finally, differences in the study populations in terms of gene by environment interactions may also explain some of the observed discrepancy in replication as has been suggested to be the case with other genes inconsistently replicated [22, 23]. However, it is not clear, which environmental factors may interact with ADAM33 genetics and if these factors could influence the associations between ADAM33 polymorphisms and asthma. As indicated by our analysis, passive smoke exposure does not seem to be one of these factors. In the meantime, a total of five genes (ADAM33, PHF11, DPP10 GPRA  and HLA-G  have been proposed as potential asthma genes by positional cloning and some more may follow. What can we learn from the experience with ADAM33? First, it seems that genes identified by positional cloning have the same limitations as other putative candidate genes suggested by expression studies, or selected because of their biological context in disease pathways. Positional cloning does not prove but suggest a role of the gene in question for a specific disease. Further evidence however can only be achieved by independent replication studies and functional molecular genetics, which both may be tedious. This process may take some time and the level of evidence for or against the involvement of a certain gene in a complex disease may only increase with time. Large and well defined replications are needed and negative results ought to be published. Our data suggest that previously reported ADAM33 polymorphisms may only have a minor impact on the development of asthma in German children. We would like to thank Anja Pleiss for her excellent technical assistance. This study was funded by the German ministry of education and research as part of the German national genome research network with grants GS 01 0122, GS 01 0172, GS 01 0002, GS 01 0429, IE S08T03, IE S08T06, by the German research foundation (DFG-Grant NI-916-2) and by the Sonnenfeld- Foundation. MS participated in genotyping, data analysis and manuscript preparation; MD performed data analysis and participated in manuscript preparation; CS, NK and TI participated in genotyping, CF, CV, BN and SL collected data; SW, UW, EvM, RN and MK contributed to the development of the study design, collection of data, data analysis, and manuscript preparation.